Hundreds of hours have already been logged CAD testing and simulating the boat’s performance among Jarrett Bay’s inhouse design team of Gary Davis, Chad Vorhees and Brandon Davis along with input from a select group of specialists, such as scientists at Materials Science Corporation and Maritime Research Associates. The team then turned to the MARIN Research Institute Netherlands for real-world validation. Jarrett Bay President Randy Ramsey explains, “We’ve worked with MARIN before and they can perform large tank and high speed testing comparable to the U.S. Navy’s proprietary tanks.” Gary Davis explains how a 12’ model of the hull was constructed and tested in what would amount to 9 to 12 foot seas by MARIN this past Spring; conducting three rounds of testing in all so far. “Everything we thought about our design was confirmed, the deflection of the hull, how it moved and behaved, it was all captured with slow motion photography. We could not have been more pleased with how it performed in every sea state.” The second round of testing included operating the model by remote control with full running gear; testing the design of propellers, rudders and struts while simulating performance in tight turns and maneuvers. “It performed flawlessly, even beyond expectations. There were people at MARIN vying for a chance to drive the model each day,” Ramsey adds. Riggs echoed that the hull and performance tests confirmed the initial computer simulations, and that results were also positive in the third round of testing of additional innovations—which for now will be a closely guarded secret. “There is much more to this build than we can make public at this time,” Davis explains. The team alludes to ground-breaking advancements not only in weight savings and load management, but also in strength and safety; some of the ideas being so revolutionary that Jarrett Bay has applied for several design patents. Among the technology that they are at liberty to talk about is the use of lightweight core materials encased in carbon fiber cloth and then resin-infused in a vacuum bagging process. 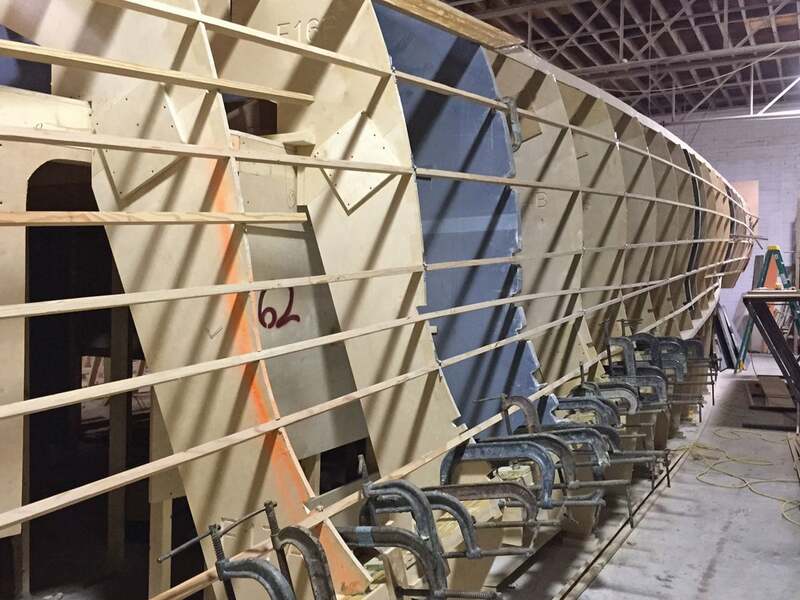 This isn’t unheard of in the art of modern yacht building, but the group says their composite lay-up is unique, down to specific fiber orientations and proprietary core materials. Ramsey notes the engineered prop tunnel design and fuel tank baffles integrated into Project Ireland’s hull as other features found only in a very select group of custom boats. 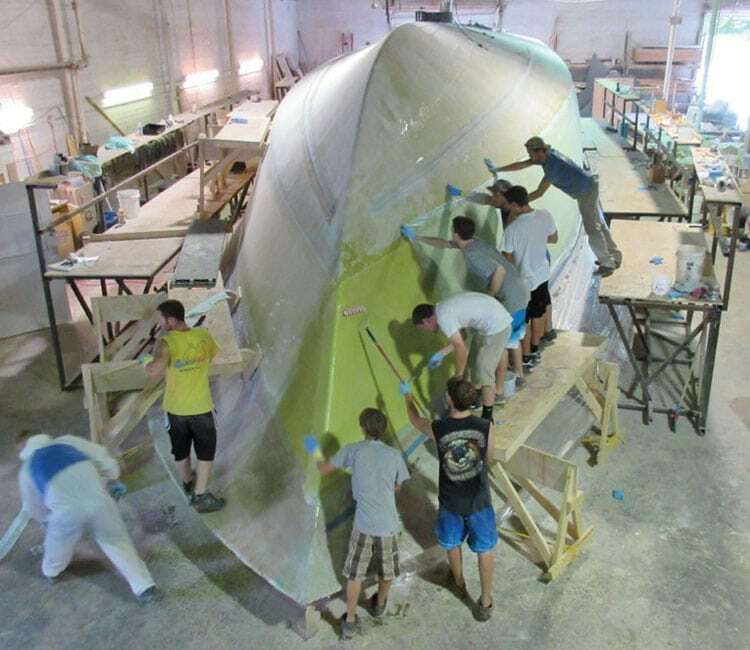 The team’s attention to detail is demonstrated in the smaller things, such as using Alexseal’s new prototype fairing compound, cutting hundreds of pounds from the hull and superstructure weight. Project Ireland is also being designed for certification under the ABS marine yacht classification, which is another series of quality and safety conditions that is said to have never been attempted before in a cold molded sportfish yacht. Sign up now to receive news alerts, announcements and special discounts from the Jarrett Bay family.